September in most parts of the U.S. brings welcome weather changes that signal the arrival of fall gardening – that means summer cleanup along with planning for next spring. This is probably the second-busiest gardening month of the year. Pull up dying summer annuals, such as petunias and marigolds that have bloomed out. Feed fall bloomers, such as hardy mums. Plant new fall annuals, including pansies and asters. Sow spring seeds and plant spring bulbs. Start clearing dead leaves, stalks and flower shoots out of summer perennials, such as hosta, echinacea (purple coneflower) and balloon flower. In purged flowerbeds, add amendments, including compost, gypsum, iron, etc., for good soil next spring. Soil test kits can tell you what your soil lacks. This is also a good time to look over the tools and the patio and lawn furniture. Be ready to put them away in good condition by the end of September. You should clean, repair, sharpen and store garden tools and equipment for the winter. Before disconnecting the hose, take an afternoon and wash off the hand tools, shovels, spades, pitch forks, etc. You should also take time to inventory chemical applications, such as pesticides, weed-killers, fertilizers, and other items, before storing them for the winter. You’ll be using the lawn mower for another month or so, but consider giving it a “spring” tune-up in September, thus avoiding the spring rush. Take it to a lawn and garden center, or learn to do it yourself. While the weather is mild, spend a couple of days in the garage or shed. Clean out old containers, throw away trash, sweep out the leaves, dead bugs and debris, and do some general organizing. Think about putting up shelves or pegboard to hold tools. In general, some time spent organizing in September will mean a lot less frustration, sweat and toil in the spring. Transplant the pansies, ornamental kale, asters and chrysanthemums outdoors that you started two months ago from seed. Now that the indoor greenhouse has empty space, use it for the outdoor container plants you want to bring in for the winter. These can include petunias, geraniums, coleus, and even impatiens. Try brining in whatever you’d like to keep growing during the fall and winter. 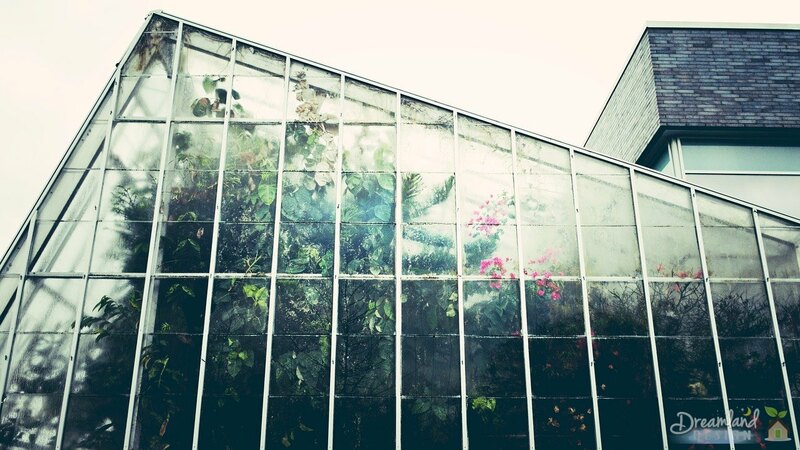 Most of these plants need the light, especially, provided by the indoor greenhouse conditions. This month is the time to begin planting spring-flowering bulbs in containers for indoor blooms this winter. To bloom, bulbs have specific light and temperature needs, and must have a period of dormancy. So, if you want tulips for Christmas, plan accordingly. Use only the best bulbs you can find for forcing indoors. Usually, you must buy new, hardy bulbs for successful forcing indoors. Try paperwhites, tulips, hyacinth and daffodils. They should be available now at garden centers and nurseries. While you are cleaning up patio pots that held annuals all summer, think about which containers you will use for indoor bulbs. For instance, paperwhites (narcissus) should be placed in shallow bowls of gravel or pebbles. Pots of soil should be used for tulips, hyacinth and daffodils. See the Forcing Bulbs section on the Home Page for more details on how to handle different kinds of bulbs indoors. Bring in houseplants that have spent the summer outdoors. Cut back leggy or damaged foliage, and trim by about one-third. The plant won’t be able to support this growth during low-light winter months indoors. Keep the plants in good light inside. Don’t water or feed for about two weeks while they adjust. After that, cut feeding to once every-other month, using a half-strength solution. Try bringing some petunias inside for the winter. (See Indoor Greenhouse section above.) Either bring in a patio container with petunias, or lift a petunia from the garden and reset it in a pot. Remember to cut them back and give them plenty of light, either in a sunny window or in the indoor greenhouse. Also, you can keep root cuttings of petunias during the winter by preserving them in sand or potting them for winter and then replanting stem cuttings from those plants in the spring. Try bringing indoors other annuals in containers, bearing in mind their light needs. Usually, low-light annuals, such as impatiens and coleus, do better indoors than full-sun plants, such as marigolds and geraniums, etc. However, full-sun plants can be kept in good condition over the winter if placed in a very sunny window or in the indoor greenhouse. Plants that over-winter fairly well are asparagus fern, vinca, coleus, lantana and geranium. Before bringing them in, inspect for bugs and disease. Keep checking them indoors for signs of problems and treat as needed. Most experts agree that September is the best month to overseed — that is, spread new grass seed on an established lawn. Most weeds are finished growing and won’t compete with the grass seedlings, plus cooler weather and fall rains promote root growth before hard winter sets in. For best results, prepare the lawn bed by dethatching, verticutting or plugging. Keep the new seed well watered for the next two to three weeks. Also, DO NOT apply any weed controls or a regular fertilizer during this time. Use a lawn-starting fertilizer formula. Now is a good time to aerate or plug an established lawn. Often this goes hand-in-hand with overseeding, but it can be done alone, simply to help give a thick, mature lawn some breathing room. Aeration is a machine process that pulls out cores of sod and soil from an established lawn. This, along with dethatching, should be done before overseeding. However, aeration, or plugging, also helps an established lawn. September is a good month to dethatch an established lawn. This can be done by hand with a rake but it’s a lot of work. A rented machine is easier to use. Either way, you remove the layer of dead grass near the soil. This gives the grass plants more light and air. Dethatching is advisable before overseeding, but also helps to regenerate an established lawn. Verticutting can also be done before overseeding. This is another machine process that creates furrows for seed in established lawns. It can also be done to help start a new lawn. September is the month to apply winter fertilizer to cool season blue grass, rye, and fescues. DO NOT fertilize zoysia now, which is going dormant. Zoysia should be fertilized in the late spring, when it comes to life again. Apply weed controls this month, if you haven’t overseeded or plugged with seed. Chickweed shows up during the fall rains. It’s cleanup time for all the dying annuals, both in flowerbeds and containers. Pull up spent plants. Apply compost or fertilizer and soil amendments to flowerbeds. Replace summer annuals with cool season plants, such as ornamental kale and pansies. Plant kale in close bunches for great color. If you have a poinsettia that you’ve been growing outdoors, bring it inside this month and place it in a sunny window. Next month, you will begin putting it in a closet each night, preparing it to bloom again by Christmas! Try bringing some annuals in containers indoors for the winter. (See Indoors above). As you clean up annual and perennial flowerbeds, prepare the soil for planting of bulbs. Loosen the soil and add fertilizer and amendments, such as compost, lime and gypsum. Bulbs also benefit from bone meal added to the soil when they are planted. If you mail-ordered bulbs for fall planting, they should start arriving in September, October and November, depending on the cool temperatures for planting in your region. Otherwise, garden centers and local nurseries should have lots of bulbs now. You may begin planting certain bulbs as soon as the temperature falls into the 60s consistently. If it’s too warm, they will begin to sprout out of season and that will stunt their spring blooms. Don’t plant tulips this month in all but the most northern zones. The ground is still too warm elsewhere. Tulips are better planted in October or November since they require an extended period of cold in order to grow and flower properly the next season. Small flowering bulbs, such as snowdrops, winter aconite, crocus, glory-of-the-snow, grape hyacinth and squill, may be planted as soon as temperatures remain cool consistently. Plant these little bulbs thickly in a protected but sunny spot, such as the south side of the house. Plant crown imperial (fritillaria imperialis) and madonna lily (lilium candidum) in September. Narcissus and jonquils may be planted now. Gladiolus also is usually not hardy in the cooler zones and should be dug and stored in September, and re-planted next spring. However, some gladiolus have been known to survive over the winter in this region if they are in a sheltered area, near the house, and the soil is covered with a generous layer of mulch. In southern zones, they over-winter quite well with no special care. Hardy asters are blooming now and need feeding and watering. If you don’t have any, plant some from the nursery this month! They make great fall bouquets and are best if planted in groups. Some of the taller types may need staking. Watch for signs of insect damage, especially from the lace bug, which eats the underside of aster leaves. Apply spray or dust, and repeat as needed. Don’t feed chrysanthemums any more after the first of the month and don’t nip the buds, either. They should be allowed to fully bloom in September. Treat the same as asters, above. The garden centers and nurseries are full of chrysanthemums in September. Plant them in groups where they’ll get plenty of sun. Water and feed well. Keep dahlias well watered. They should be blooming in September. Watch for pests, such as aphids, and treat accordingly. Remove the tops of peonies, cutting leaves and old flower stalks down to about two inches above ground. If peonies suffered from disease, such as leaf spot, blight or root knot, that kept them from blooming and growing properly, cut off all the tops near the crowns and discard or destroy them. If there was severe infestation, remove the top layer of soil around the plants and replace it with fresh soil. Hybrid or tea roses are usually revived by the cooler temperatures and fall rain, and will bloom from September until the first heavy frost. Keep watching for disease, such as black spot, and insect pests. Cut back stalks of dying perennials and clean debris out of perennial flowerbeds. Apply compost and soil amendments, then add fresh mulch. Keep weeding. Plant spring-blooming perennials and biennials, as seeds or nursery stock. These include hollyhock, sweet pea, echinacea, madonna lily, myosotis, and Oriental poppy. Get nursery stock from local garden centers or through mail-order catalogues or online nurseries, along with your order of spring bulbs. Many flowering perennials will bloom until frost. In seeding or transplanting, don’t forget to prepare the soil and water in new transplants, bulbs and seeds. Mulch the area afterwards to protect from winter “heaving”. Divide and transplant thick beds of lily-of-the-valley. Re-set the separate “pips” in a cool, shady spot where the plants have space to multiply. Pips can also be obtained via mail order or from garden centers. For peonies, September and October are the best months to divide and transplant. Peony roots can be planted in the spring, but they likely won’t bloom the same year. Peonies transplanted in the fall have time to establish roots before the spring blooming season. Use a sharp blade to cut through the thick root systems and pull them apart to form separate plants. When you transplant, make certain not to cover the “eyes” or the little crownlets. Peonies planted too deeply will not thrive. Also note: divided and transplanted peonies will not produce blooms for the first three to five years – so don’t be impatient. Just feed them and keep the greenery healthy. Once they get going, peony plants last a long, long time. Many other perennial plants may be divided and transplanted or seeded outdoors this time of year. Crickets begin appearing this month and try to come indoors. Place mothballs or moth crystals around the foundation outdoors and along the floorboards in the garage and basement to discourage them from coming inside. Examine fruit and ornamental trees for signs of borer damage. This should be treated in September, since borers continue their attack during the winter months. Look near the ground for masses of gummy material. Apply controls as needed. Treatment in late September or early October will take care of borers before they do much damage. Examine junipers for signs of juniper midge damage—brown discoloration of new tip growth. Treat as needed. Watch out for poison ivy, which turns orange and red in the early fall. A small, semi-trailing plant with three-lobed leaves. It’s abundant in woods and thickets and along stream banks. It is also very common along roadsides, and is found clinging to fence posts and trees. In the fall, poison ivy has clusters of yellowish-white berries. Trim back ground ivy, vinca, grape ivy, Boston ivy, euonymus and other ground covers that have rambled outside their bounds, especially those that have climbed around trees and bushes or have attached suckers to the house. Any deciduous trees can be pruned now. 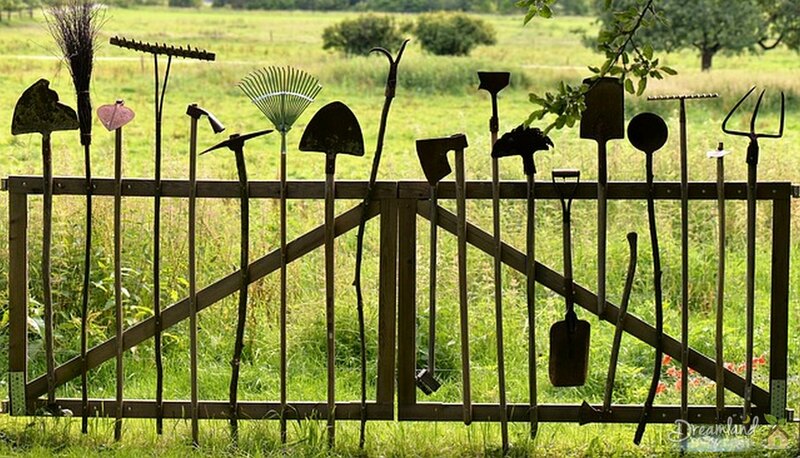 It’s a good time to clean off, organize and put away all the garden tools you will no longer be using. 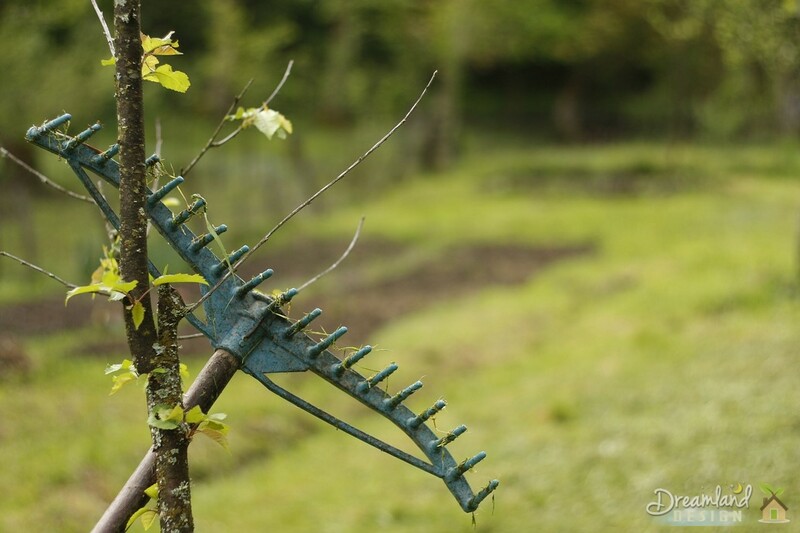 Scrape off the dirt and rust from metal implements, and oil them. Repaint wood handles. Throw away broken tools. Get a big box and put them all together, or put up pegboard and hang them neatly. Bring in sprinklers, sprayers, watering cans and other items that are no longer needed. Clean, oil and store them. For shrubs, September is the last soil cultivation for the year. Let the soil remain rather rough — not in clumps — but no need to smooth it down, since it will catch and retain more fall and winter moisture that way. Evergreens may be planted in September, as soon as the summer heat has passed for certain, usually after a good fall rain. Shrubs transplanted in September will have better root growth than those transplanted in November during a dormant state. Do not prune flowering shrubs this late in the season, since you will be removing the flowering buds for next spring; also, pruning will stimulate new growth, which will be killed in winter. Prune after flowering next spring. Spread fresh mulch around trees and shrubs. Fall rain is usually adequate, but if there is a dry spell of 10 to 14 days without rain, do some watering before you put away the hose for the winter. Remember to water newly transplanted trees, shrubs and perennial flowers. Remember to water the cool season annuals you have planted: ornamental kale, asters and chrysanthemums. While putting things away and cleaning up, look for the bird feeder. You’ll be setting it out in another month or so. Start cleaning off, repairing and repainting lawn and patio furniture, especially wood pieces, such as swings. Repaint and seal cracks in garden statuary. Delicate statuary and fountains should be brought indoors, if possible, or they should be well protected with covers of heavy plastic or tarps for the winter. Take photos of your fall plantings, the remaining annuals and perennials, and the trees that are starting to turn color. Update your garden journal with final notes on the summer season, what you plan for the fall, next spring. September is also a good time to check with your garden budget and see how you came out so far this year. Clean out the barbecue grill and store or cover for the winter.